I'd like to think that the Fourth World didn't come to a screeching halt, as long-time Jack Kirby assistant Mark Evanier says it did in his afterword to the Jack Kirby's Fourth World Omnibus Volume 4 (even though indeed it did). In fact, if you tilt your head and squint a little bit, I'd argue there are moments in this fourth volume that almost feel like conclusion. It's obvious that throughout it all, Kirby never lost sight of the overriding themes inherit in each of his Fourth World series. The Forever People, who've tried to uphold their vow of non-violence throughout their time on Earth, face in the end Devilance the Pursuer, whose own raison d'etre is to cause violence as he goes. When Mark Moonrider asks Devilance whether he really wants to fight an endless war, it's a summary of the Forever People thus far, and fitting that they end up on a peaceful planet all their own. In New Gods, Orion finally accepts aloud that Darkseid is his father, the issue with which Orion has struggled throughout the series. Even more poignant, however, is Darkseid's seeming acceptance of Orion, going so far as to kill his assistant Desaad for plotting against Orion. 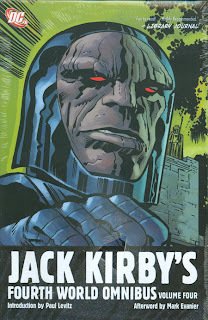 Kirby's Darkseid has been remarkably complex throughout these books, far moreso than his modern incarnation as a petty dictator; Darkseid has been at times a wandering philosopher, strangely disconnected from his flunkies' attacks on New Genesis. That, in the final issue of New Gods, Darkseid does not kill but rather assists the main hero of the story, speaks volumes for Kirby's Fourth World work. Evanier writes that Kirby shifted Mister Miracle to become a traveling showman more to add a greater superhero aspect to the series, but it also helps define the Mister Miracle series for the fourth volume. The emotion in these final volumes is rather understated, and Kirby lets us imagine how Scott Free's adoption of the orphan Shilo Norman helps Scott overcome the trauma of his own youth. Kirby suggests that we see the "real" Big Barda in her almost-maternal training of Shilo; the single panel where she admits that she loves Scott is heartbreakingly simple. When this series ends, its clear how far the young refugee Scott and his family have grown since the first volume. But one can't be faulted for seeing Kirby himself, or at least Kirby's sentiments, in Darkseid in the last pages of Mister Miracle. "I am the storm," Darkseid says, representing himself the forced end of the Fourth World saga. The wedding, Darkseid quips -- in a moment that is truly quintessential Darkseid -- “had deep sentiment, yet little joy. But -- life at best is bitter-sweet" -- as must the end of the Fourth World have been for Kirby. With the end of the remaining Fourth World series, the fourth Omnibus volume jumps forward ten years, to Kirby's Fourth World graphic novels. Though no time has passed in the story itself, Kirby's change in perspective is riviting -- whereas much of the Fourth World stories have dealt with a communal relationship between man and technology, a la the Mother Box or Habitat, the stories "Even Gods Must Die" and "Hunger Dogs" carry a theme of technology overtaking man's progress. Here, Darkseid misses the days of scheming and combat now that Apokolips fights New Genesis using remote-control bombs called "Micro-Mark." There's a sense that Darkseid is behind the times by not embracing this hands-off technology, a Darkseid past his prime. The story ends with Darkseid alone, left behind by New Genesis and superseded by Apokolips; I believe he returned to power off-screen, but it would have been something to behold to see Darkseid rip away all the technology to take part again with his own two hands. Even as things change in Kirby's final Fourth World stories, however, he also returns to old themes. Orion faces Metron's old student Esak, now horribly scarred by an accident after being neglected by Metron; Esak's madness, and Orion's tender use of the Mother Box to heal the dying child, quite certainly reflects Orion's own violent struggles over these stories. And when Highfather of New Genesis chooses to allow his planet to be destroyed by Darkseid's bombs rather than fight back, Kirby once again evokes the non-violence of the absent Forever People. The Fourth World omnibuses have offered interesting behind-the-scenes peeks all along, but this final volume's comparison of the original Hunger Dogs versus the published version is the most fascinating of all. We see here the rather smaller story Kirby began to tell about Orion, and how he expanded it to include the destruction of all of New Genesis; that Kirby could weave a larger story amidst the original pages of his smaller one is as much a testament to his genius as all the rest. We are fortunate for these omnibuses not just to relive the Fourth World work of Jack Kirby, I think, but to understand it all the better. 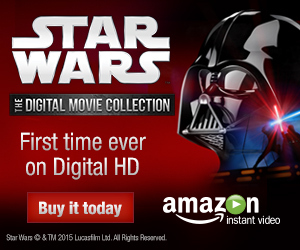 In his afterword, Mark Evanier praises the collection of these stories, and how well they now sit on the bookshelf. Let me tell you, the Jack Kirby Fourth World Ominbus series has made me a fan of the omnibuses all together, and I'm eager to add the Starman and JLA volumes to my bookshelf. I understand how some people feel cheated by DC Comics latest press to release more complete hardcovers of their key series, but I'm just so thrilled at the specialness of it, how these comics that I love are being preserved for history. If you've not cracked open one of the Jack Kirby omnibuses, I encourage you to try; I've been thrilled the whole time. We continue our journey through the Fourth World now, perhaps a tad perversely, with Death of the New Gods, on our way to Final Crisis, coming up next.